The Mega Truck scene is blowing up in the RC world and JConcepts has a new item to spice things up. 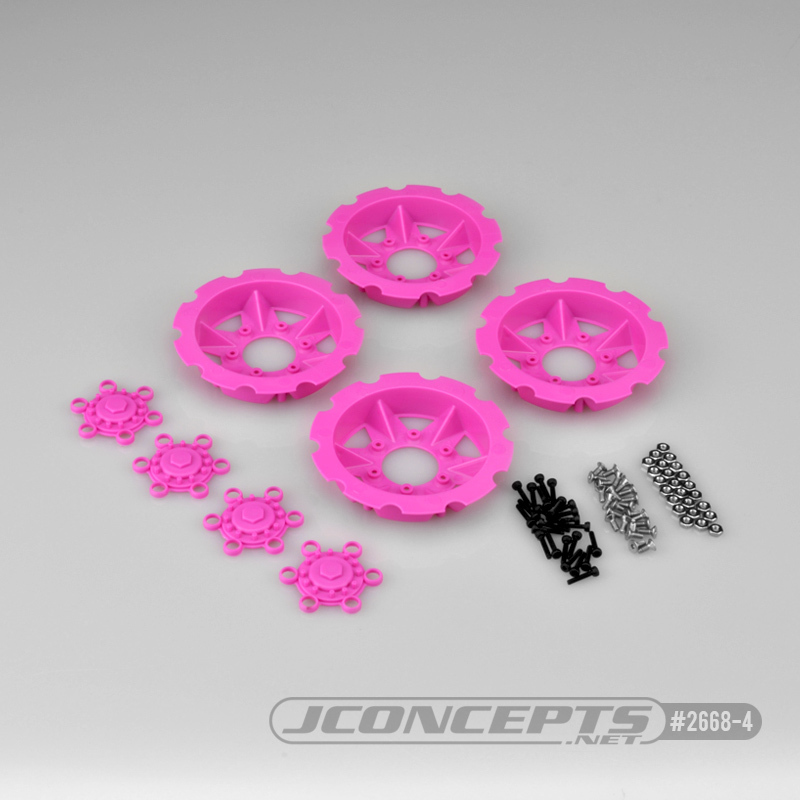 The Tracker wheel discs are replacement options for the Dragon wheel sets to provide a new look or to simply change the color scheme to existing wheels. Inspired from Weston Anderson’s Bog Hog, the Trackers sport a burly, angular steel-like build similar to versions utilized on the real deal. When it comes to Monster and Mega trucks, JConcepts is all-out scale looks and performance. The injection molded, 2-piece design item, features a full-face that covers the wheel and is secured from the inside-out. The Tracker set is unique and includes a cover for the wheel nut that creatively interlocks with the disc to create a completely closed off mega truck look. Available in multiple colors, the disc set includes four disc pieces, four wheel nut covers and hardware to make the installation to a #3379 Dragon wheel set. Assembly notes – first, it’s necessary to drill out the outer perimeter holes on the Dragon wheels with a 2.5mm drill bit to allow the new screws to clamp the assembly. Install the M2.5 x 6 FHCS into the wheel disc from the reverse side and install the disc on the Dragon wheel with the supplied M2 x 10mm SHCS. With the disc now in place, the wheels can now be installed back on the vehicle. Once installed, add the wheel nut covers into place locating on the large boss openings on the disc. Using a 5.0 mm nut driver, secure the included nuts to complete installation. Please note we do not supply direct to the public. Our full range of products are available via any of our UK dealers whom can be found in our dealer locator at the top of the website.